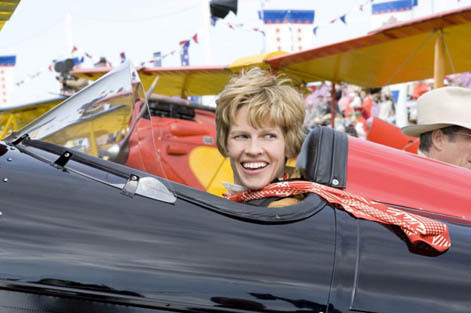 The life of Amelia Earhart was one of liveliness and mystery. She was the first woman to fly the Atlantic seas, and then mysteriously disappeared never to be seen again. I’ve always been fascinated by this person. She seemed carefree and lived life to it’s fullest. When she married her husband she did so only under the condition that if he didn’t satisfy her within a year she was free to leave him. Some would call him nuts to marry under those terms but hey, if that woman was Amelia maybe I’d make a similar sacrifices myself. The new film “Amelia” is brought to us by Mira Nair who tries her hardest to make this movie work. It has wonderful actors. 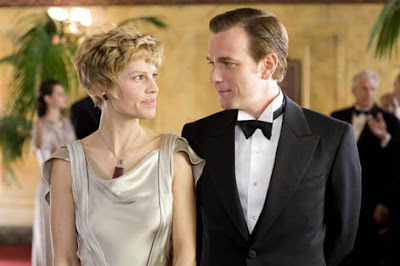 Hilary Swank and Richard Gere seem like perfect casting choices to play the lead roles (though a supporting role by Ewan McGregor seems more for publicity). I personally don’t think Swank is much of an actress. Having seen her in good and bad films, I’ve come to the conclusion she can be great when the script is right but she herself can not bring something to the script. This movie does not change my mind about her, but her acting does stand out in a movie that does not. The cinematography is beautiful and sweeping. I had to think back to Martin Scoresese’s underrated “The Aviator” to recall a more recent film that captured the wonder of flight and aviation so well. Clearly this was a film made from love, but I sense the studio may have gotten too involved in the making of it. I sense that a studio executive read the script, saw some of the early work, and saw Oscars in the films future, and had it retooled to encompass that vision. Of course I’m being skeptical because I have no idea how many changes (if any) were forced on the film, but for something that looks this good it should feel more special then it does. Amelia Earhart (Swank) is not portrayed as a woman with a free spirit, but rather a feminist who has a point to prove. When she talks about how she loves the feeling of being free when she flies it all feels phoney and by-the-numbers. The film makers have to cut to a clip of a young girl looking into the sky stupidly, as if they are admitting that Swank’s speech is not terribly convincing on it’s own. 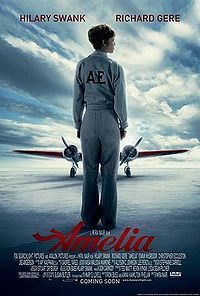 When Amelia has a brief affair with aviation pioneer Gene Vidal (McGregor) it feels...passionless. Like the characters looked at each other, saw they were both pretty, and decided there was some rule that stipulated that they just HAD to get in bed together! 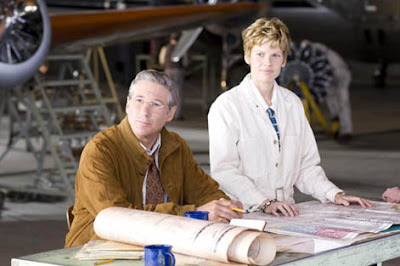 The only time Amelia seems truly happy is during brief moments with her patient husband George (Gere), which shows just how “free spirited” she really is in this movie. The movie does have an exciting climax where Amelia and her navigator search in vain for the island they need to land on, and simply disappear never to be seen or heard from again. This all sounds nice on paper and there are moments, but the drama and heart seem flat and lifeless. Swank will likely grab a third Oscar nomination considering the weak competition in the Best Actress category, but I feel the film is harmless but instantly forgettable. Parents, there is some mild language and a love affair, but nothing is explicit. Recommended for ages 8 and up..